[Nixon] said he had a “very disturbing report,” gleaned from an unnamed Air Force general, that the enemy was moving thousands of tons of supplies into South Vietnam.... [Hubert] Humphrey branded the Nixon charge "totally irresponsible," and accused the Republican of trying to "frighten the American people." This charge was a big deal at the time, because then-President Lyndon B. Johnson had negotiated a ceasefire in Vietnam, and Nixon was casting doubt on whether it was working. My question is, was Nixon telling the truth that an Air Force general had told him that the North Vietnamese were moving thousands of tons of supplies into South Vietnam? And was it actually true that the North Vietnamese were doing this at the time? Unless a particular Air Force General 'fesses up in an autobiography, the first question is unanswerable. On the second question, absolutely that was happening. It had been happening for years, escalating in quantity and variety of supplies transported, since at least 1959. 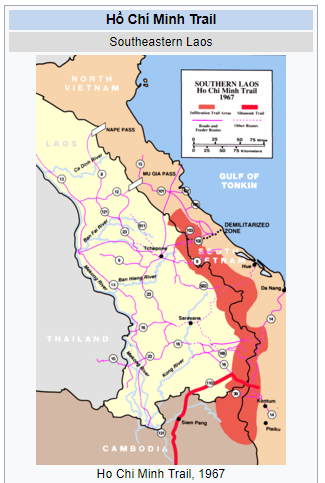 The supply trail was known as the Ho Chi Minh Trail, ran through the mountains of neighbouring neutral Laos and during the final weeks of the 1968 campaign the Air Force was making final preparations for Operation Command Hunt against it. This bombing campaign began November 11, just 6 days after the Nov. 5th election. As noted in Wikipedia, the North Vietnamese had spent most of 1968 expanding the Trail following the Tet Offensive in January that year. Wikipedia suggest the yearly trail capacity in 1968 was between 10000 (1964) tons, 81000 (1968 reserved offensive supplies) tons and 40000 (end 1970) tons. It usefully doesn’t specify which ton. The first and last estimate appear to be for the overland route controlled by the 559th. Nixon’s statement regarding the logistic capacity of the PLAF/PAVN appears substantially correct, even if it discounts indigenous supply by NFL/PRG manufacture and capture of ARVN materiel. Whether Nixon was informed of this by an airforce general cannot be verified to the standards of Sceptics, but it is reasonable to assume that Nixon had been briefed by someone who knew the logistic situation and I’m inclined to extend the benefit of the doubt here. The claims are substantiable and the claimed source is reasonable. Nixon didn’t have any motivation to lie here; shocking people with the truth had the desired political effect. Not the answer you're looking for? Browse other questions tagged united-states war election 1960s vietnam-war or ask your own question. What was the influence of dead people on Johnson's 1948 election victory? Is it true that US tracer rounds were red and VC green during Vietnam war? Why was Truman considered a heavy underdog in the 1948 election?